Goodreads says, "For budding costume designer Lola Nolan, the more outrageous, the outfit—more sparkly, more fun, more wild—the better. But even though Lola’s style is outrageous, she’s a devoted daughter and friend with some big plans for the future. And everything is pretty perfect (right down to her hot rocker boyfriend) until the dreaded Bell twins move back into the house next door. 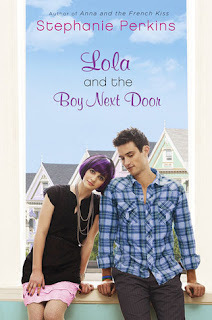 When the family returns and Cricket—a gifted inventor and engineer—steps out from his twin sister’s shadow and back into Lola’s life, she must finally reconcile a lifetime of feelings for the boy next door." *I loved Anna and the French Kiss, so I am definitely going to be reading this one. In fact, Perkins is one of my new favorite authors; I love her writing style! I am soooooo excited to read this one! I'll definitely be pre-ordering! YAY! I SO can't wait for this! I love Stephanie Perkins! I'm quite curious about this book. How was your trip? I want pictures. This sounds adorable! I'll need to catch up and read Anna and the French Kiss. This does sound like an intriguing story...thanks for sharing. This one sounds good and I must admit that I love the cover! Yes, please! Can't wait to see what Stephanie Perkins has in store for us next. Anna was such a fun, fun story -- loved it so much! YES!!! I'm DYING to read this one, Anna and the French Kiss was so amazing, I cannot wait to get my hands on this one:) Fantastic pick Christina! Oh the cuteness!!! I have the first one but haven't had a chance to read it yet. still i'm definitely waiting for this one too. I hope you had a great Spring Break!! I loved Anna and the French Kiss but going from the description I think I'm going to like Lola even more. This looks really fun! Definitely adding it to my list! I haven't read Anna and the French Kiss yet...but I want to, and this one sounds great too!